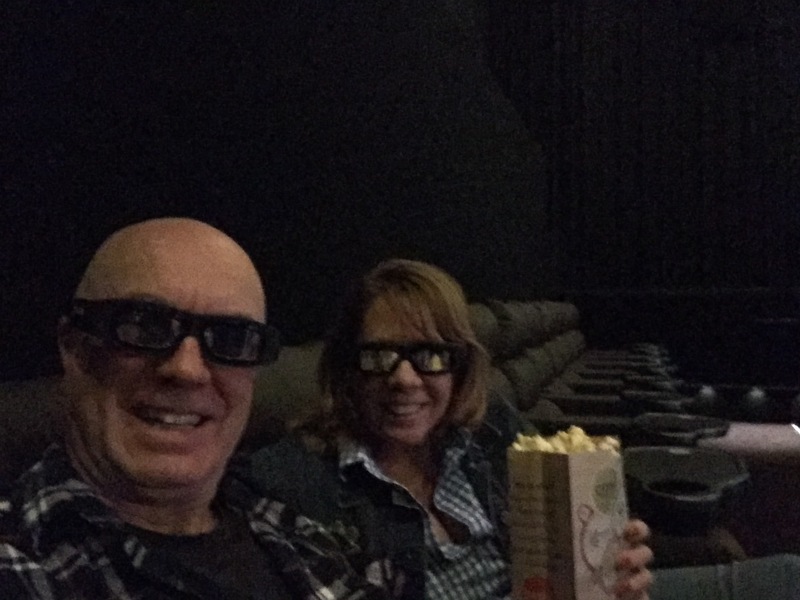 The Woman got us two tickets at Angelika (reserved recliner seats, beverage and food service) for a 3D viewing for $39.00 plus $6.25 for a small bag of popcorn. It’s been a long time since that first Star Wars movie in 1977 when I paid something like $2.25 for my ticket. Star Wars must be the biggest event since 9/11 that brought people together in the United States. What is it with this? It’s just a movie, right? Yet, my Facebook feed is full of families taking selfies (like we did above) of themselves at the theater. This phenomenon is different from any other movie I know. Is it because the franchise spans generations? I was as fascinated with the very first Star Wars movie in 1977 as I was with this one now. I never would have thought in 1977 that I’d walk out of the theater after watching Episode VII almost 40 years later and within an hour call up my 27-year-old son to discuss the movie, particularly since 1977 was many years before I had even met the mother of my children. It’s partly because of its timelessness that Star Wars is a cultural phenomenon. There really is no plot to speak of. Luke Skywalker disappeared a long time ago and there is a secret map that supposedly leads to him. The First Order (the bad guys) want the map because Luke is the last Jedi and they have to get to him to eliminate him before The Force challenges them. The map is in the cute little droid. Epic space battles ensue to get the droid. In the end, do they find Luke? Star Wars never was about plot, and this continues to hold now. Star Wars is about special effects, imagination and dreams. It’s a fairy tale. There are several effects about Star Wars that are my favorites. I love the relics of crashed spacecraft which were present in every episode, including this one. The picture above is of a giant, kilometer-long battle cruiser crashed on a desert planet. Never mind that a hulk of metal this size is not likely to just come to a skid-landing like an airliner would, mostly intact. Upon reentry, it would cause a crater the size of Rhode Island, cause an extinction event and leave no trace of itself other than globules of molten metal. But that aside, it’s really cool to see the Millennium Falcon fly into the engine opening and then traverse the hulk at top speed, just like you’d expect in a Star Wars movie. I also like the realistic portrayal of transportation technology, whether that’s the levi-cycle or the beat-up metal shells of the fighter craft that somehow always are immediately space-ready. 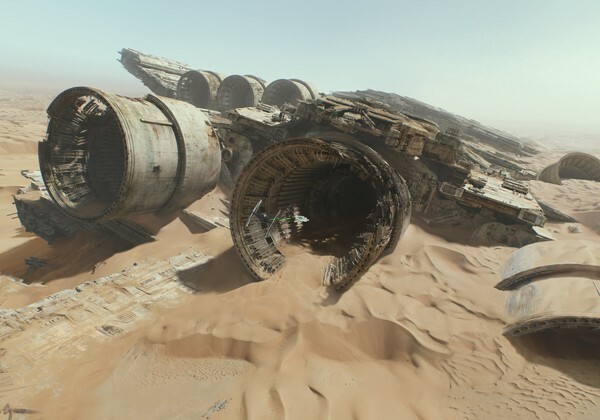 The Millennium Falcon, Han Solo’s ancient ship, plays a major role in this episode, and I enjoyed seeing how the ship they call a piece of junk just lifts off, lumbers a bit, scrapes into the ground and mountains as it makes its way into the air and into space, and finally into hyperspace in just a matter of seconds. I want to fly that ship. Then there are the aliens. Consistent with my expectations, there is always a bar scene where all manner of aliens congregate and speak mostly English, except for the very bizarre ones that only chirp, burp or growl. Even though most of them are humanoid, with a weird head, two legs and two arms that bend like those of humans, I could watch hours of footage of Star Wars aliens. In my opinion they are the most realistic of all cinematic aliens and alone worth watching the movie for. Finally, I always get a kick out of the hoodies in Star Wars. The old emperor of the dark side used to wear a full-length burka-style robe made out of rough-hewn material with a hood that hid his face. The new bad guys also wear black robes, with hoods, and the good guys wear gray and white robes, with hoods. It makes me want to get one of those and wear it to work, so my colleagues will think I am really into “the future” of a long, long time ago in a galaxy far, far away. Now that Disney has bought the franchise from George Lucas, and the movie is pegged to make more money than any movie in history, we can be assured that there is a future for Star Wars. I will continue to watch the sequels, and so will my eventual grandchildren. They will post selfies of themselves at the theater, and they will be able to tell their kids that their grandpa was there, alive, back in the last century, when the first episode burst into American cultural history.